A suburban child runs across a perfectly manicured lawn. Instinctively, the sight of a billowy dandelion seed head is irresistible. It is a vivid contrast, a gem arising from the managed monoculture of grass otherwise known as a lawn. But the wonder and awe of discovering nature via chance encounters is often replaced in adulthood, by a need to control and manage our natural surroundings. The dandelion, once perhaps, a fascinating flower species, becomes a weed- an uninvited inconvenience that doesn’t fit into the planned symmetry of the divided parcels of land we inhabit. Nature then, becomes a series of management objectives. Management considerations affecting our environment are wide-reaching in scope. Even well intended science -based management often represents anthropocentric values. But there is a growing consensus among the various levels of environmental management that we have a problem of epic proportions, and it’s worsening by the year. It’s the problem of invasive and exotic species infestations. Commonly the argument is made that conservation is approached from a resource-based, special-interest perspective. This may offer insight as to why exotic infestations that occur on commercially undesirable lands tend to be left to fester. On the other hand, it is sometimes difficult to justify the excessive amount of “management” and intervention that takes place in other areas. Closer examination of the financial and political pressures that underlie many of the decisions that prompt these environmental modifications often reveal our priorities. I can think of no better example than South Florida. Healthy pine flat woods, for example, meet current standards if they have a pre-determined ratio of saw palmetto to slash pine and sabal palm. It is difficult for one to discern the origin of these standards or the perceived necessity of the interventions made in an attempt to keep these wild lands “compliant.” Especially as we recognize that the Everglades represents an ecosystem truly in its geologic infancy. If these standards are not met, the “imbalance” is corrected by various methods- all of which are potentially disruptive and expose the ecosystem to several risks. Namely, opportunity for non-native species to establish. Note that slash pine, sabal pine and saw palmetto are all native species in a “preserved” environment. However, even despite the absence of non-native species, it still is thought to require “mitigation” due to an undesirable or incorrect species composition ratio. It might be said then, that all of our wild lands are being evaluated on the basis of aesthetics, or perhaps some human conceived mathematical paradigm which designates correct species ratio and proportion. Nature isn’t in charge. Due to excessive human intervention in the form of national wildfire suppression campaign, habitat fragmentation, exotic species introductions and unsustainable development practices, many of our ecosystems are on life-support. And the last remaining great subtropical wilderness in the world, the Everglades, is one of our best examples. Fire has been reintroduced and the remaining intact (however altered) ecosystem is “preserved.” However the problem of introduced species has proven a formidable enemy, and the means with which we attempt to mitigate it are equally as tragic. By definition, a native species is a naturally occurring organism that has co-evolved over long periods of time, with other species in a natural habitat, and has grown within the structural framework of that ecosystem via a series of natural adaptations. It is kept in check by limiting factors such as hydrology, topography, soil chemistry and composition, the presence of natural enemies, climate, and varying requirements for nutrients and sunlight levels. In a true, natural ecosystem, each native species is a single part which contributes to the functioning of the whole, and performs an ecological service therein. These services include wildlife forage, soil stabilization, erosion prevention, nitrogen fixation, and regulation of temperature and local climate. Some of these services are understood, however many still elude our understanding. A sharp contrast, non-native, or “exotic” species are those that have become established in an area where they do not naturally occur. Intentional or otherwise, this results in substantial damage to the ecosystem into which it has been introduced. When an exotic species establishes in a location where its natural limiting factors are absent, the results are often dramatic. Outside of these limitations, these plants quickly outcompete native species. They change the chemical composition of the soil and disrupt soil pH as well as soil permeability and moisture levels. They proliferate in times of drought or flood (in times perhaps, when native plants would temporarily cease their growth) and more efficiently exploit needed resources than native species do. These plants display rapid growth rates and appear unrelenting in their patterns of establishment their subsequent tenure. They often establish primarily in disturbed or fragmented habitats (along roadsides, developed areas, etc) and they tend to gain footholds toward the interior of the ecosystem quickly. They even secrete hormones and noxious chemicals to deter the growth of competing species, as seen in sand-hill communities. These factors combine to allow the exotic species to alter an ecosystem with seemingly minimal effort- often paving the way for more invasive exotic species. The result is an alien landscape offering none of the original ecological services provided by the ecosystem inhabited by native species. And the implications are often horrific. Expanses of Brazilian pepper (Schinus terebinthifolius) are found throughout the state of Florida, and form impenetrable walls of tangled branches and roots. And within these areas, few, if any viable populations of native plant species remain. Not only does the pepper tree completely shade out any hopeful sapling, but is an example of a plant which emits a noxious chemical from its roots, effectively discouraging other nearby native plants from growing. Another example of a specific adaptation that adds to the arsenal of weapons that exotics collectively use in their establishment is the rhizome of Torpedo grass, or Panicum repens. These rhizomes are torpedo shaped at the tips, and act like drill bits pushing through the soil. This allows it to grow 4-5 times faster than native grasses. It effectively chokes up Florida’s already perilous waterways, creating issues of eutrophication and anoxic conditions that further encourage the growth of exotic aquatic grasses and fish kills wherever it proliferates. Species such as these, when introduced to a new habitat, prove to be unremitting and persistent. The term “weed” makes no implication of whether a species is native or exotic. It simply refers to an opportunistic species that is considered undesirable. It often grows well in disturbed areas and is generally an unwelcome finding in a lawn or garden. Historically, exotic species have been introduced for a variety of reasons. Since the beginning of recorded history, human beings have been transforming pristine natural areas into urban centers and agricultural lands. Species thought to be useful to humans have been moved from continent to continent, and these species have shaped the course of both human and natural history. Intentional introductions typically occurred based on the belief that the species would have commercial and/or ornamental value. For example, agricultural crops are often exotic (and, almost exclusively, managed monocultures.) Cattle and other forms of livestock are frequently introduced species, as are many ornamental flowers, shrubs, and fruit bearing trees. 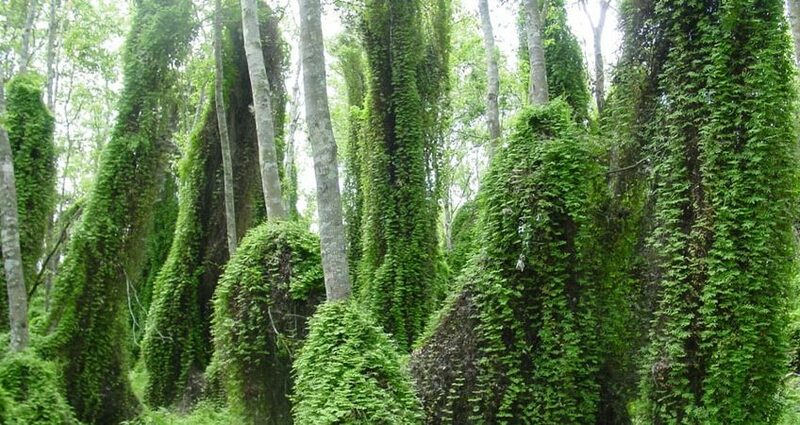 In the early 1900’s in the state of Florida, exotic tree species were introduced en masse, by the US Army Corps of Engineers as part of a planned and concerted effort to lower water tables in the Everglades, and convert “useless swampland” into land with development potential. Miles of Australian pine and melaleuca were planted while canals were dredged. These canals further enhanced the growth and spread of exotics by fragmenting habitats, acting as fire barriers and spreading pollutants and excessive nutrient runoff. It wasn’t until many years later that the consequences became evident. Thick, impermeable monocultures, the destruction of critical habitat and the loss of biodiversity were widespread. By then, the devastation was irreversible. Drought, water pollution, red tide events, and the extirpation of native species were already well under way. Helpless, conservation biologists were forced to stand by and document the decline. Accidental introductions occur as means of mass transport move across continents and seas. On a more local level, seeds become lodged in mowers and tiling equipment, on clothing and shoes. Others arrive in fruit and vegetable imports. It is often postulated that not all exotic species become invasive. During the years that I monitored the exotic strawberry guava in the Everglades, they seemed to remain stationary. Some exotics then, appear to reach an equilibrium and are kept in check by environmental limiting factors. Especially if their new environment resembles the one from which they originated. But this is the exception and not the rule. Many of these so-called “tame exotics” often reach invasive status after changes in weather patterns or an ecological disturbance. There are invasive exotics representing just about every genus on almost every continent today. According to the University of Florida, there are “over 1,400 non-native plant species throughout the state” (University of Florida, 2014). In fact, according to an estimate made by the Florida Bureau of Invasive Plant Management, over 1 million acres of Florida’s wild lands and waterways have suffered extensive damage and biodiversity losses due to exotic and invasive species infestations (Florida Bureau of Invasive Plant Management, 2001). In viewing the scope of the ecological and economic losses associated with allowing these species to proliferate, it is imperative that land managers and conservationists understand the necessity to intervene. Waiting for nature to correct the mistakes of man decades later is futile. It is flawed thinking. Several methods for controlling exotic species infestations in the US and abroad have been implemented. These include manual removal, prescribed fires, biological controls, and the various means and methods of herbicidal treatment. It is essential that we understand the risks and benefits associated with these methods. Our chosen method can pose enormous ecological threats that are, in scope, often equivalent to, or worse than the consequences of letting the exotic species flourish. We make judgment calls and are often wrong. It is outside the scope of this discussion to discuss the particular chemicals used in modern herbicides. However these chemical compounds are manufactured to be tenacious and effective. They do not readily break down as they move throughout the various living and non-living components of our environment. They are, as Rachel Carson called them in 1962, “persistent.” In her monumental book Silent Spring, she writes: “In the less than two decades of their use, the synthetic pesticides have been so thoroughly distributed throughout the animate and inanimate world they occur virtually everywhere. They have been recovered from most of the major river systems and even from streams and groundwater flowing unseen through the earth. Residues of these chemicals linger in the soils to which they have been applied a dozen years before. They have entered and lodged in the bodies of birds, fish, reptiles, and domestic and wild animals so universally that scientists carrying on animal experiments find it almost impossible to locate subjects free from such contamination” (Carson 15-16). This summarizes the scope of the problem from a scientific perspective. But in order for one to fully comprehend the enormity of the problem, one must witness, first-hand, the condition of the sprayed area post-application. These areas are notoriously easy to locate. They are characteristically “dead.” Devoid of any plant life at all, their soils are barren, and nearby native plant species display widespread chlorosis. They appear withered, and brown. Then of course is the unforgettable smell of the poisoned nearby waterways. Secondary succession- or the plants that return after a disturbance, are the species that can most easily re- establish after the disruption of its environment. In other words, hearty species, especially those considered “weeds” will be the first to return. In most cases, these are the same non-native species originally targeted forremoval. And so the cycle perpetuates. While herbicide application may sometimes level the playing field for native species, too often it merely prepares the site for yet another exotic infestation. It hinders the ability of the site to provide for the needs of native species and withholds such toxicity that little else will grow there. Suffice to say, replanting with hearty native species after herbicide application is seldom thought of, and rarely seen in post-treatment management plans, despite observations, decade after decade, that clearly demonstrate that the target species is the most likely to recolonize a treated area. This is especially true in areas whose surface area border urban areas, fence lines, ditches. Conclusively speaking, the amount of herbicide currently needed could decline over the coming years if only this single follow-up measure were to be taken. Further to this, a great deal of seed source is often left behind after treatment. Pre-emergents are currently under careful scrutiny, but one should be cautious of a chemical that can “tell” a plants DNA to cease growth. The effects of such a chemical could be devastating to non-target species. The labelling of these chemicals are often the result of testing done in controlled environments. The manufacturer can make no claims about how “herbicide A,” a normally a non-carcinogenic and somewhat selective chemical, will behave once it interacts with the particular chemical profile of Florida water and soils. It’s a game of Russian roulette. Herbicide sprayed on the bark or cut stump of the target species inevitably washes into the soil and finds its way into surface water, groundwater, and aquifers. After application, they inevitably come into contact with insects, fish and amphibians, who form a large portion of the food chain. In this way, it concentrates as it reaches top predators in the food chain. It affects herbivorous snails, but a predatory bird who consumes several of these snails carries a higher concentration of the chemical. The large predator who eats several of these birds will carry a large, often fatal dose of the chemical in its tissues, as was seen in the Everglades when several Florida panthers were found to have high levels of herbicides in their tissues. Animals inevitably succumb to this poisoning. Rachel Carson called this “biomagnification,” and provided several case studies that depicted the harrowing devastation endured by exposed animal populations. The reality is, we unintentionally destroy a multitude of non-target plants (which are each essential to the functioning of the ecosystem) as well as animal life. But we do it to prevent future losses. It’s called damage control, and it has become as self-perpetuating cycle of further damage. Realizing the futility of herbicide use, the observant and philosophically minded among us might seek answers in true earth-centered ecology. “Of still deeper significance perhaps is the duty of non-interference as it applies to the freedom of whole species populations and communities of life. The prohibition against interfering with these entities means that we must not try to manipulate, control, modify or manage natural ecosystems or otherwise intervene in their normal functioning. For any given species population, freedom is the absence of human intervention of any kind in the natural law like processes by which the population preserves itself from generation to generation. Freedom for a whole biotic community is the absence of human intervention in the natural law-like processes by which all its constituent species populations undergo changing ecological relationships with one another” (Taylor 17-175). It is a freedom however, that we have forfeited ourselves and stolen from nature, because we have created conditions which now require our continued intervention. This is an important statement, and in retrospect, if this had been the rationale guiding the decisions of the individuals responsible for the environmental modifications we now are desperately trying to undo, we wouldn’t be facing the homogenous, rapidly spreading biological deserts we wrestle with today. Also strikingly relevant here, is his reference to the changing relationships between species within natural communities. When exotic species are introduced to an ecosystem, this principle is violated. The course of these “changing relationships” are forever diverted. If we follow the reasoning of ecological philosophers such as Leopold and Taylor, we understand that these species establish and DO occur in a new locations. This follows basic biological principles. Species are programed to survive. Monocultures are an indication that the species has been successful in its invasion and subsequent establishment. But they are also an indication of an interrupted process, a manipulated ecosystem. As a natural consequence, other species, which were less successful at exploiting the resources of that particular habitat, can, and often do vanish. Natural species migrations are indeed, part of the changing relationships Taylor refers to. Seed dispersal occurs via wind, water, and animal feces. Many seeds have specialized parts that allow them to “stick” to animal fur. These seeds are are carried across natural boundaries and moved between communities as part of an ever-changing landscape over time. Individuals within a species or a community will out compete each other and seek to broaden their territories. They are fluid, non-stationary, and biologically programmed to expand and spread. And in even in the absence of the troublesome intervention of man, invaders will come. But the devastating alien monocultures we contend with today will not result in ecological homeostasis. And while man should rightfully attempt to right the ecological wrongs of his predecessors, he is not likely to accomplish this by the distribution of non-selective poison in vulnerable natural areas. For when he does this, the ecosystem no longer functions within the natural parameters within which it evolved. It is chemically altered. Life, on every level, from soil microbes to top predators, will know its effects. And its essential wildness is lost. As Bill McKibben stated in his book The End of Nature, “We have deprived nature of its independence, and this is fatal to its meaning. Natures independence IS it meaning- without it there is nothing but us” (McKibben 58). Along these same lines, we must realize that when we intervene and manage any natural system, it is no longer a natural system. Something fundamental is changed. It cease to be what it was before. The actions we take will produce very different ecological outcomes than those which would naturally occur in a non-manipulated environment. The use of herbicides is one of the most striking examples of this. The knowledge and information one acquires over a period of years working for the protection of wild lands makes for a troubling set of internal conflicts. In viewing the problem of non-native species, what makes it difficult to subscribe to non-interventionist philosophical thinking, is the reality that these infestations are themselves primarily the result of human intervention. The result has been an enormous loss of biodiversity- the destruction of habitats that are already in a precarious state. This loss of biodiversity due to habitat changes resulting from invasive species appears to take the process of evolution and run it in reverse. This has given rise to a field of study known as invasion biology, which is, essentially, the study of the various behaviors of species after they have been introduced to new environments, and the various ways the host ecosystem and native species respond. In his book Out of Eden, Alan Burdick writes: “The invasion biologist is ecology’s emergency-room physician, discovering how ecosystems work by watching how they fall apart” (Burdick 23-25). Anyone who has had the unfortunate experience of standing under the canopy-like covering of an air potato infestation in a forest has witnessed this sad phenomenon- the browning and withering slow death of everything below it. It is a conservationist’s nightmare. A rich ecosystem which took millions of years to evolve, can, in only a matter of a few growing seasons, be reduced to just a few species- sometimes, perhaps, just one. This is the premise for invasion biology. It is the “ology” of a crisis of enormous proportions. And it seems very few of us are truly paying attention. Non-intervention then, seems altogether negligent. But a broader, deeper look into the problem reveals that the use of chemical herbicides will not offer viable long term solutions, and will almost certainly only serve to perpetuate it. Still, garden-center shelves are lined with glyphosate, and triclopyr based products that require no special licensing for their use. Even herbicides with EPA Category III acute toxicity ratings, such as metsulfuron methyl are sold commercially and with little discretion. These products are some of the most biologically active compounds used in land management today. And they continue their devastating tenure in the soil and water into which they inevitably accumulate. The effect on human health is almost immeasurable. These well studied chemicals have their origins in WWII era biotechnology. They are neurotoxic, are endocrine disruptors, and are both teratogenic and carcinogenic. Human infants are born with concentrations of these chemicals in their tissues worldwide. Yet still, with few other options, we continue our chemical assault. It seems that the exotics outnumber our best efforts, and resistance in target species is growing. But there is still yet another method, though only perhaps slightly less precarious. When I discuss biological controls I am often reminded of the intentional and well-meaning introduction of the giant cane toad, Bufo marinus, which was released on Florida sugar plantations to control a pest insect. The giant cane toad is now an enormous problem for which we have no solution. Still land managers are asked to pardon these past mistakes. The new consensus is that scientist have a better grasp on the process- a set of procedures that effectively monitor and screen biological control species. Our resolve is tested, and nature continues her tenure despite us. Ironically, a biological control is another exotic introduction. It is typically an insect or fungal species. The insect or fungus is monitored and tested in quarantined conditions in laboratories in excess of ten years to ensure that non-target species will not be affected. Essentially this is based on finding the natural enemies of the target species, which are usually obtained in the geographical region from which the non-native originated. It is a prudent and diligent process. After the quarantine period, the subject is then intentionally placed directly on, or in close proximity to, the target species. A good example of this is the bromeliad population in the Everglades. Once a thriving and almost magical species, it is now a less common sighting. During my tenure as a Park Ranger in the Everglades, each morning, several more of our charismatic bromeliads lay dead, their vital roots and tissues aggressively devoured overnight by the exotic Mexican bromeliad weevil, which is thought to have arrived here accidentally via pineapple shipments. The morning “bromeliad body count” became a dreadful routine- a painful process to witness. By studying bromeliads in Mexico, it was discovered that a parasitoid fly by the name of Metamasius callizona naturally lays its eggs in the larvae of the weevil, thereby stopping its proliferation. After many years of study under controlled conditions, I was delighted to have taken part in the first release. Several releases of the fly have taken place since, and results are still being monitored. We don’t know with any degree of certainty that in the future, this fly won’t attack native weevils. Species change, and we can’t always predict them. But for now, it may be our only hope. In the meantime, native bromeliads have been collected from the wild and brought to nurseries while the fly establishes. If we remove our hand from the equation now, the species may not survive. A second example is the melaleuca weevil, Oxyops vitiosa. This insect is native to Australia, where melaleuca trees are in their native range, and are a natural enemy of the melaleuca tree. By introducing it to the Everglades, biologists are bringing it to its natural food source. This weevil damages melaleuca trees by way of defoliation- specifically, by voraciously attacking the stems, buds and leaves of the tree, leaving it unable to reproduce or photosynthesize. This has shown great success, and the impact to the everglades has been far less dramatic than the aerial spraying of herbicides. Invasive and exotic species infestations are a world-wide phenomenon. In many of our most sensitive and endangered habitats, those already on the brink, these plant species take advantage of the mutability of the ecosystems. The result is a type of biological entropy. Herbicide use adds to the cumulative stress these fragile ecosystems endure. By virtue of the numerous types of damage they inflict upon natural systems and the ruinous conditions they leave them in, we must conclude that herbicides are not an ecologically responsible method of intervention- and history proves that these chemicals have not proven efficacious. They do not reverse the trend of infestation unless infestations are caught early. This is not always feasible in preserves and wild lands that cover thousands of acres. But what of prescribed fire as a method of control? In fire dependent ecosystems like the everglades, prescribed burns are seldom a hindrance to these species- many of which only complicate burn plans by raising flame heights and fire intensity, often resulting in crown fires and unplanned fire spread. Cogon grass and melaleuca are two such examples. With so few control options, and so many exotics covering so many acres of land, what are land managers to do? How will we as a species ever return an ecosystem to a state of non-intervention when the only solution is intervention? In his article, the Wilderness Paradox, The renowned nature writer Jordan Fisher Smith posed this question: “What has replaced naturalness as a guiding philosophy of what to do or not do?” This, indeed, might be the question for ecologists and land managers of our time. As a Park Ranger in the Everglades, I spent many years studying theories in order to prepare for my practice. Yet in my subsequent years of practice, I had to unlearn much of the theory I had learned. Textbooks seldom prepare you for the wildness and paradigm shifts of the natural world. The only conclusion I have come to regarding exotic species is that the solution isn’t a simple one. It requires international cooperation. This includes stricter controls at ports and more stringent regulations on imported goods. In the US, it would require state-wide management plans that are written, implicated, and enforceable by law. Best management practices and management plans with species-specific methods for removal that do not disrupt neighboring native species are paramount. And it requires mandates that span public and private lands alike, encompassing state, county, and federal enforcement. The Florida Department of Environmental Protection has a policy of publishing unit management plans that accurately document the extent of their non-native species infestations and clearly outline their goals. Though well-intended, and often the result of years of careful observation, the individual parks lack the manpower, time, and funding to pursue their ambitions. These well-written plans are beautiful, elaborate documents that are often left to collect dust in ranger station filing cabinets while the parks struggle with the realities of their daily operations. Both public and private level organizations like the Florida Exotic Pest Plant Species Council (FLEPPC) and the Florida Fish and Wildlife Service are making progress in several ways. Exotic species amnesty days and public information campaigns have made tremendous gains in this regard. They offer free mobile phone apps that allow users to photograph, identify, and enter GPS coordinates for exotic species reporting purposes. This innovative use of technology allows for rapid identification and response, and empowers individuals to become involved and motivated to find solutions. Groups that come together to form task forces often organize volunteer days, during which they target specific species in designated areas and document actual plants or acres treated. Local newspapers include columns on featured exotic plants and animals to help residents to recognize, report, and mitigate infestations. Sometimes this means removing an exotic and planting a native in its place, one plant at a time. It’s a herculean task that requires incredible tenacity and persistence, and an enormous commitment based on the principles of restoration on a minimally invasive scale. It requires a shared understanding and the bringing together of people with a common goal- undoing the damage that centuries of human error have done. The principles of deep ecology and non-intervention are applicable here, however only in retrospect. For the already established invasive species, they offer us little guidance. However, they are useful in that they serve as a sobering and poignant forewarning, and as a sort of counsel to all of us. A strong message about the natural world that speaks loud and clear. Man’s interventions in nature will always have repercussions and consequences that far surpass our ability to control or even comprehend them. Burdick, Alan. Out of Eden: An Odyssey of Ecological Invasion. New York: Farrar, Straus, and Giroux, 2005. 23-25. Print. Smith, Jordan. “Orion Magazine | The Wilderness Paradox.” The Wilderness Paradox. Orion Magazine, 1 Sept. 2014. Web. 13 Mar. 2015.